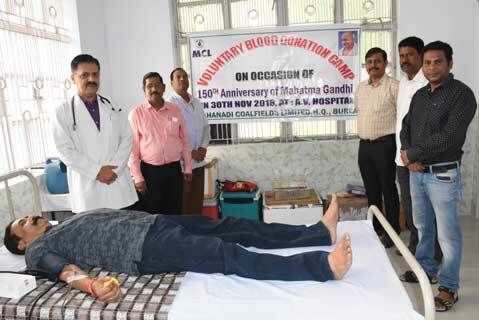 Sambalpur: Anand Vihar Hospital, Mahanadi Coalfields Limited (MCL) at Burla organized a Voluntary Blood Donation camp on the occasion of 150th Birth Anniversary of Mahatma Gandhi (for a period from Oct,2018 to Oct,2019). The Blood Donation Camp was inaugurated by Sri L. N. Mishra, Director(Personel),MCL in the presence of Geneal Manager(Welfare) Sri Dilip Kumar Panigrahi, Dr. Debashis Gupta,MS/IC, Sr. Medical Officer Dr. B. Sahoo and Dr J. Mishra,, and a large number of MCL employees and their family members. Chief Guest Sri L. N. Mishrs,Director(Personnel) appreciated the residents of MCL Jagruti Vihar and Anand Vihar Colony for such a noble initiative, adding that nothing can be a substitute of blood, if required to save live. The camp was conducted with the support of doctors and staff of MCL Anand Vihar hospital and VIMSAR,Burla and Red Cross Society.